Three years ago, the Lisgar Junior Boys Volleyball team lost in a heartbreakingly close semi-final game against Samuel Genest. Two years ago, the Junior Boys, consisting of many of the same players, were eliminated once more in a semi-final game against Samuel Genest. Last year, the Senior Boys had the talent and potential to win everything, but the disruption of Bill 115 prevented Lisgar from fielding a team. This year, the Senior Boys Volleyball team is out to redeem themselves. And redeem themselves they have. The season started in high fashion at the Queens Invitational Tournament. Despite having no practises beforehand, the previously unknown Lisgar Lords were the talk of the tournament as they came out with a second place finish, losing in a narrow final to Regiopolis Notre Dame, Kingston’s 7th consecutive City Champions. A few weeks later, the team found success once again at the Sam’ Frappe Tournament, hosted by Samuel Genest as they beat out schools such as Franco-Cite, St. Michael’s, and Louis Riel to bring home the gold medal. 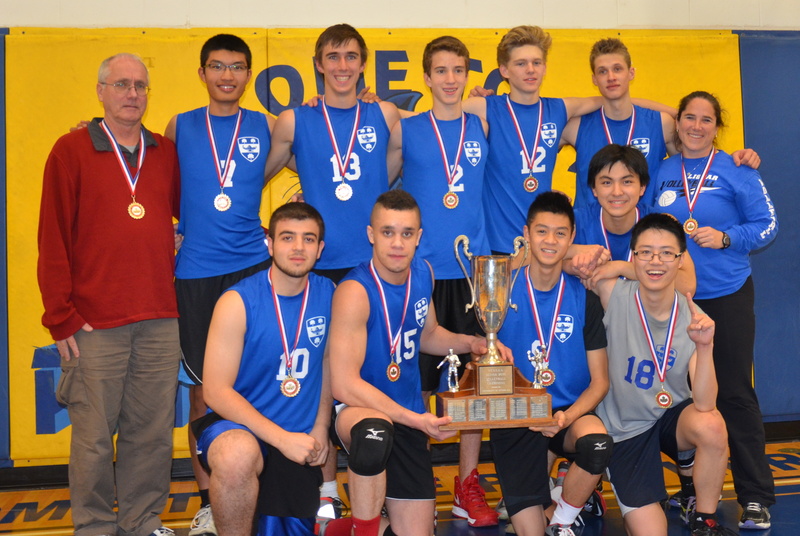 In season play, the Lisgar Lords dominated with a 9-1 win/loss record and continued their success by winning their semi-final game in straight sets, and eventually, taking home the title of City Champions by defeating Longfields Davidson in the AAA/AAAA final held at Lester B. Pearson. OFSAA this year will be hosted by John Paul II Catholic Secondary School in London, Ontario, and will include the 18 best “AAA” teams from around the province. For the graduating players, it will be the last time that they wear the Lisgar blue. *Update*: The boys placed 3rd at OFSAA, beating out the seven-time City Champions Regiopolis Notre-Dame from Kingston in the Bronze Medal match! Congratulations goes out to Sena Katigiri, Isaac Mckeague, Jin Xu, Josh Isaac, Gareth Luke, Stephen Kary, Tom Davidson, Ben Harper, William Wu, and Abbas Ghandour for their incredible season.